One thing I love about Farmer’s Market season in this area of Missouri is that green tomatoes are generally available all summer long. Caledonia, although in a midwestern state, is pretty southern in both identity and in cuisine; and fried green tomatoes are a local favorite. I make a lot of them because, well, I love to eat them and to cook them. The flavor is pleasantly sour with a hint of tomato sweetness, and the texture is crispy on the outside, with a firm body and pleasant chew. I like my fried green tomatoes cut a little thicker than most—about a half-inch—because I like them nice and juicy, and cutting them thinner makes more of a fried green tomato cracker that is a bit drier. That’s fine if that’s how you like them, just cut them thinner than described in the recipe. I use fried green tomatoes for breakfast as a base for Eggs Benedict, replacing the English muffin; and I also use them as an appetizer for our guests who choose to add one of our fabulous dinners to their stay. The salsa that goes with them is so good—from the smokiness of the grilled corn to the brightness of the fresh tarragon—yum! The salsa can be used for lots of other things, as well. Try it with grilled fish or chicken—perfection. I hope you enjoy this recipe from your friends at the Old Caledonian Bed & Breakfast! Get a BBQ grill screamin’ hot. Pour the peanut oil into your hands and rub it on the corn to coat with oil. Grill the corn on all sides until roasted, with some dark and charred spots present on the corn. Allow to cool for a bit, then use a knife to remove the kernels from the corn. 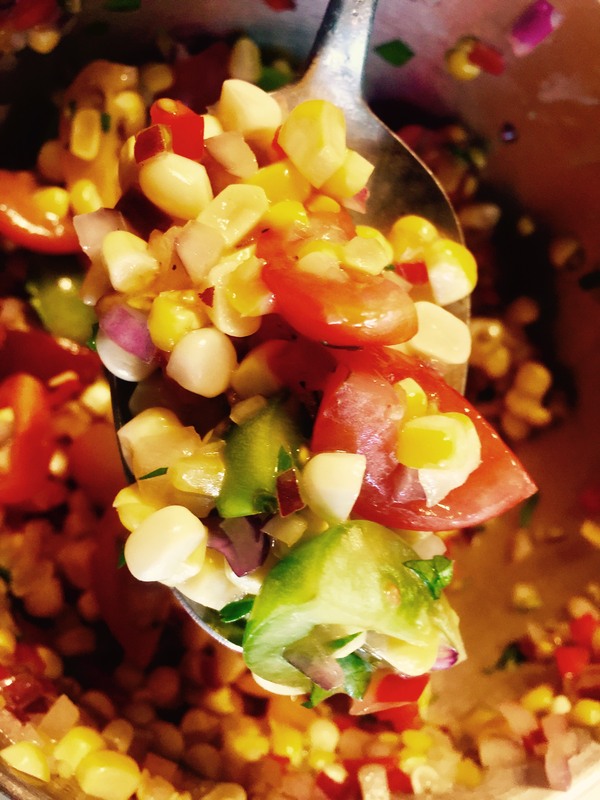 Combine the corn, onions, pepper, cherry tomatoes, and tarragon in a bowl and set aside. In another bowl add the vinegar and the mustard. While whisking briskly with a wire whisk, add the olive oil in a slow, steady stream until mixed in completely. Add this vinaigrette to the bowl with the vegetables. Mix well. Season with salt and pepper. Place in the refrigerator until ready to use. Slice each tomato so that you get at least four nice slices of equal thickness from each. Combine the flour, cornmeal, salt, pepper, paprika, cumin, coriander, and granulated garlic in a good-sized bowl. Have the egg mixture ready in another bowl. In a large, preferably cast-iron skillet, heat about a quarter to half an inch of the peanut oil over medium heat until a little flour thown in lightly sizzles. Dredge the tomato slices well in the flour mixture, shaking off the excess. Then coat them in the egg mixture until completely coated with a thin layer of egg. Then dredge them again in the flour mixture, shaking off the excess. Place the tomato slices in the skillet. They should lightly sizzle and be nicely browned in about two minutes per side. Adjust the heat accordingly to make this happen. Flip gently with a slotted spatula. Continue until all tomato slices are fried. Drain on a rack or on paper towels. For each serving artfully arrange two slices of Fried Green Tomatoes on a plate and top generously with the salsa. Serve immediately and enjoy!